Wondering what documents are needed to get a US passport? The exact requirements vary from service to service, so please see our passport services pages to get the specific US passport requirements checklist you’ll need for your request. However, there are basic general requirements for US passports that are needed for any service. Read on for our guide to passport requirement information. All documents submitted for passport requests should be original documents, unless it is made clear that you can submit a photocopy. All passport documents that require signatures, such as forms and letters, must have original signatures in blue or black ink. Proof of US Citizenship – If you have a valid or recently expired US passport, this is your proof of citizenship. 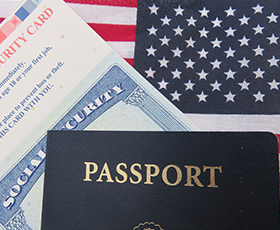 Other proofs of citizenship include birth certificates and US naturalization certificates. Proof of Identity – You’ll verify your identity by showing a document like your valid driver’s license. Passport Application – Your passport application can be filled out by hand or online – either way you will need a printed copy with your original signature. Passport Photo – You’ll need one passport photo, which must be a recent photo with a plain white background. Proof of Travel – If you need expedited passport service, you must submit proof of travel showing departure within the next few weeks.